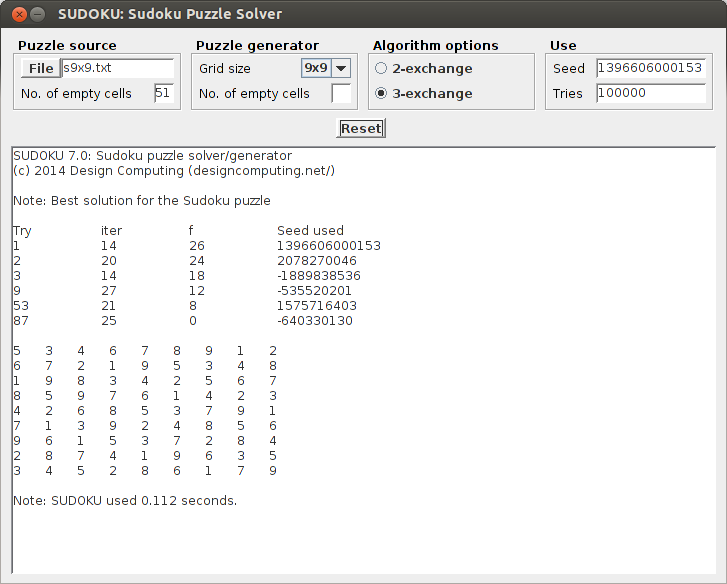 SUDOKU is a Gendex module for solving/generating Sudoku puzzle. 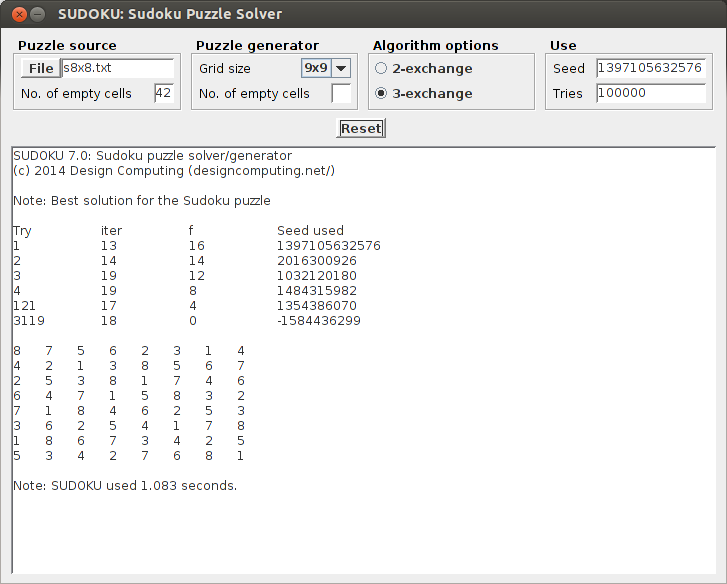 It uses an unpublished exchange algorithm of its author and can solve Sudoku puzzles of different grid sizes: 4x4, 6x6, 8x8 and 9x9 (see http://www.menneske.no/sudoku/eng/). The box sizes which correspond to each mentioned grid size are 2x2, 2x3, 2x4 and 3x3 respectively. For a given Sudoku puzzle of grid size nxn, the mentioned exchange algorithm minimizes the objective function f where f=F-n2 and F is the sum of the number of times each digit occur with itself and other digits having the same values in each row and in each column. Users who are familiar with design theory can see that F is sum of the trace of NN' (concurrence matrix of column components of the grid) and trace of MM' (concurrence matrix of row components of the grid). The 2-exchange algorithm swaps the positions of two digits in a replicate. The 3-exchange algorithm swaps the positions of three digits in a replicate. When f becomes 0, the solution is obtained. 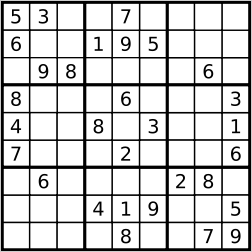 Note: SUDOKU is designed to solve a Sudoku puzzle of any size. However, it is much more successful with puzzles of size 9x9 or less. Let's assume all Gendex class files are in the directory c:\gendex and suppose you want to find the solution for Sudoku puzzle in the previous Section. At the working directory, create a file say s9x9.txt with missing cells replaced by 0's. 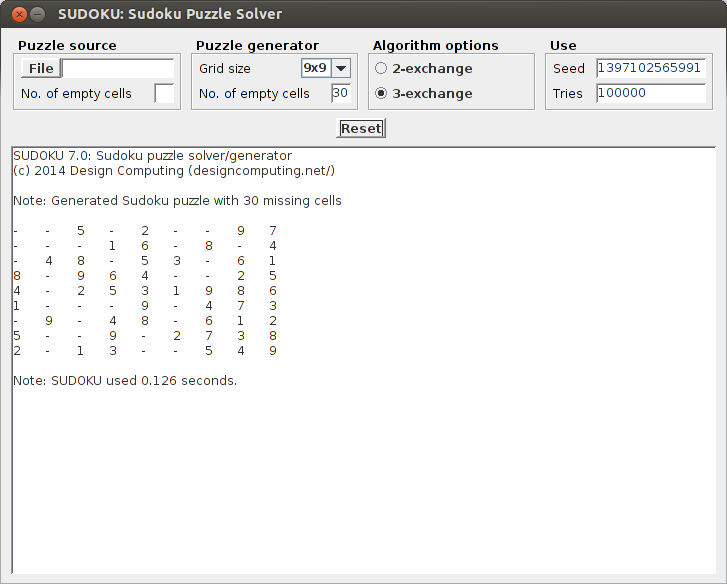 To generate a Sudoku puzzle, you have to leave the File field blank and specify (i) the grid size (either 9x9, 8x8, 6x6 or 4x4) and the number of empty cells. Below is a generated Sudoku puzzle for the gird size 9x9 with 30 missing cells. f, the objective function. The program automatically stops when f=0. The time in seconds SUDOKU used to obtain this solution.